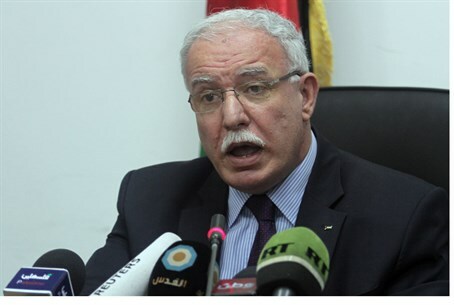 PA FM reveals Arab ambassadors mulling unilateral resolution demanding recognition and withdrawals, likely to be put off yet again. The council of Arab UN ambassadors gathered on Monday to discuss the Palestinian Authority (PA) resolution set to be proposed at the UN Security Council, unilaterally demanding recognition and Israeli withdrawals - however, the vote on the resolution set for Monday looks to be postponed yet again. Last Friday PA chief negotiator Saeb Erekat announced that the vote would be held that day, or at the latest this Monday. But according to PA foreign minister Riyad Al-Maliki, the vote doesn't seem likely until the new year begins. Al-Maliki told the Palestinian Arab Ma'an News Agency that the amended resolution has not been submitted yet, despite reports to the contrary, according to Walla. The resolution demands UN recognition of the PA as the "state of Palestine," as well as Israeli withdrawals from eastern Jerusalem, Judea and Samaria by 2017, and prior to that a 12-month deadline for wrapping up negotiations on a final settlement. If the council of Arab UN ambassadors agrees to submit the resolution it will be reviewed by the UN Security Council, but Al-Maliki noted that due to the new year many foreign ministries of the Security Council's member states have shut their doors temporarily, indicating the resolution may be put on hold for next year. Al-Maliki emphasized that the PA will try to push the resolution forward in the coming days, but explained the matter isn't dependent on the PA.
Likud Central Committee chairman Danny Danon, who is challenging Binyamin Netanyahu for leadership of the party, on Saturday night said that if the UN recognizes the PA as "Palestine," Israel should respond by declaring sovereignty in Judea and Samaria. "If on this coming Monday the UN recognizes a Palestinian state, the state of Israel must respond with unilateral steps (as well), including implementing sovereignty," declared Danon. Russia has said it will support the resolution, and while US Secretary of State John Kerry has not publicly stated that Washington would use its veto against the resolution, his spokeswoman recently said the United States will not support the resolution.